There are real ways to make money on the internet. It’s unfortunate that scam artists prey on our hopes and dreams of becoming rich. They tell us that our dreams can and will come true. They tell us that it is possible to become wealthy, without moving a finger, (well perhaps a few finger movements – like clicking a mouse) but only if we do what they say. They claim to have discovered, developed or perhaps even stumbled across a “Secret” method to effortless income and special ways to make money on the internet for free that they have personally used to become so very rich, that money no longer matters to them and now they are making it available to “only a limited number of people”. They claim that anyone can do it just as they have and with their “secret” – you too, can make a true income online. Making money on the internet from home with the thought of becoming very rich, stirs our emotions because secretly we want to believe them and feelings swell inside us and these feelings become the greatest weapon the ‘scammers’ have because those emotions shove aside all logic and it’s emotions that direct our actions. The ‘scammers’ know this and that’s why they use psychology and employ powerful emotional triggers to engage us with their presentation. Fortunately, there are a number of elements within most scams that will them give away. Once spotted you will easily recognize them and be alerted to the potential online income scam. 1. The first of which is the almost ‘unbelievable’ opportunity, being presented that has been specifically designed to stir emotions within us. A great example of this type of SCAM is here: https://secretmillionairesociety.com/ 2. There is also the Lack of information – disclaimer; …“I have no idea how much longer this will be up online” or…“I have no idea how long this will last, but this is still the opportunity of a lifetime!”… “This is your chance to make a true income online” or other such empty promises. 4. Another tip-off is the usual props (that appear in most scams). Mansions, Exotic Cars, Money and amazing lifestyles. Successful ‘scammers‘ often bag their prey by dangling enticing things in front of them and making you believe that success is easy and possible without having to do very much. 6. There is also no clue as to how they got your email or how you were randomly selected and they never address you by name nor do they know your personal circumstances. Yet they want to give you (a total stranger) the secret to effortless, lifetime wealth because they have a BIG heart. When you see them in this light they really are obvious and clearly laughable. A typical via the internet scam often reaches thousands or millions of people, which is a strange way to reveal something that they, say, they want to keep secret or reveal to only a limited number of people. (These online income scams accept a “limited number” of responses so they can quickly close down and disappear into cyberspace with your money). Often times there are spelling errors in most fraudulent emails which are usually obvious and many times, deliberate. The errors help to avoid spam guards that ISP’s use to spot scams. Also, bad grammar and poor punctuation are usually a hallmark of fictitious solicitations which are often written in bad English, have CAPITAL LETTERS and usually contain improper punctuation. Check out the “About Us” or “Contact Us” pages. Most scams won’t have one or won’t respond to your inquiry and many fake sites have little content and usually, there is no physical address or phone number and the email is from, a free service email provider. Also, check out who the owner or company is and then find out how long the website has been online. Most scam sites aren’t around for long but not always some have been in existence for many years. A video to help show the age of any website using a simple Google hack can be found here. You can also check Domain Whois to see when the domain was first registered. (Bear in mind that a name may be registered long before a website is created) But by doing this type of research will give you an idea as to who’s behind, the ‘opportunity‘. If you can’t find them, then chances are its a scam. Another resource is https://www.scamadviser.com/ you just put in the URL and it gives you an overview based on a number of metrics as to the sites trust worthiness. The latest trend in get-rich-quick schemes offer, unlimited profits from things like trading on the currency markets such as binary options and other such methods of easy-money opportunities with statements such as “the secret to making $4,000 a day” using some secret software or insider trick. The scam of course is; if these systems really worked, as well as they say, why is it so inexpensive and why are they telling you? The thought of easy money may be appealing, but success generally requires SOME work. With 5% of Americans stuck on unemployment or working only part-time it’s no surprise that millions of people are interested in work-at-home jobs to supplement their incomes. Stay-at-home-parents, unemployed, people struggling to make ends meet, people who are in between jobs and others hoping to get ahead, are all potential targets for work-at-home type advertisements and internet scams. That’s why you see them everywhere, all over the web, in your inbox, and even stapled to telephone poles around the town. Unfortunately, most of these jobs and offers are scams. But like all good scams, there’s a reason they continue to survive because there’s always a grain of truth in them. An example of a “Work from Home” Scam “Local mom makes $6,795/month part-time!” How? Easy! By posting links on websites. Helping charities raise money and signing up friends. Is this possible? Yes – but then, so is winning the lottery next week. If you follow that ‘mom’ offer (amazing how they know what town you live in and how there are only a few spots left) You will be directed to a page that explains how by posting carefully crafted links around the internet will enable you to cash in on thousands of transactions, with an online affiliate income program with a highly respected, multi-billion dollar company. By getting friends and others to buy through your links to Amazon (the multi-billion dollar company) and you will earn a percentage of each transaction. However with a little further digging and research you actually find the real point of the elaborate website is to get you to pay them $40 a month ($300 for a year) so you can be taught “how to get people to enroll in this program” and “how to get people to buy through your links”. Can you really earn $6,795 a month? Sure but you will need about 300,000 – 400,000 ‘friends’ to buy something from Amazon – so it does work. However the real con comes after you have made the initial purchase (usually $67 – $97) when they call to ‘up-sell’ you into more expensive (and often worthless) training programs to make the real money. It’s important to note that many of these work-from-home propositions are NOT total fakes, because people do make money working with these kinds of programs, however they just are not quite what they seem. In the end, most of these programs make money by selling people into the training programs. So they soon forget about selling products via links (that’s way to hard), instead they make money by selling “training memberships” to other people. Another way these work-from-home schemes can operate is by using a pyramid scheme. What is a pyramid scheme? Take a look at this youtube video below and discover how to spot these. So, What’s a Legitimate work-from-home job? Writing is one. Plenty of folks make $10 or $20 an hour writing blog posts, but that can be hard work if you know nothing about writing. However, outsourcing writing assignments to places such as Fiverr.com could be on way to overcome any lack of writing skills you may have in this area and still leave you a profit. Virtual assistants can make about the same, doing annoying detail work for busy professionals, such as scheduling appointments. Translation services can be mildly lucrative, but you need a pretty specialized language skill to do that. There’s money to be made taking surveys, though we’re really talking small amounts. Offering services yourself, on Fiverr or Odesk and others, could be another way to make money as there are people making a good living and an honest income online by doing just that. There are legitimate ways to make money on the internet I have personally sold many eBooks on Fiverr – so I know there are legitimate ways to make money on the internet. So how do you spot a work from home scam? The best rule of thumb is this: “Anytime you have to pay money, in order to earn money – before you make any money, you are not applying for a job – you are instead a part of the sales process”. If you want to know how to get a million dollars online (scam free) go here. How to create an income online? As a would be internet marketer myself, making ‘money online‘ has not been without its challenges. If you have no ‘marketable skills’ to sell online, then you may need to consider an online affiliate income program. Because there are so many pieces to the puzzle and there are many ‘scammers’ who are happy to sell you a ‘part of the whole‘. There are plenty of ‘shiny objects‘ to distract you and plenty of money making affiliate programs, promising you unlimited wealth (or so they say). You need to get educated on the things you need to know, the tools, the processes, and systems required to build a long-term successful, sustainable, honest internet business. Yes! There are legitimate ways to make money on the internet.But there are also many scams out there that over-promise and sadly under deliver. Fortunately for me, after many years of struggling through all the B.S, confusion and scams (that are so prevalent on the internet). I am happy to report that I have found a great educational resource that simplifies and streamlines the entire process. This program has everything you need to get a great education, create a real, sustainable, successful long term, online business, without any hype or B.S. It is a straight forward, honest, down-to-earth program, created by online marketers for online marketers and it won’t cost you a fortune or have you continuously buying ‘upgrades’ and ‘extras’ like many other programs. You know upfront exactly how much you are paying and the value that you receive in exchange is awesome. Honestly, I wish I had found this program earlier. It would have saved me enormous amounts of time going through time sapping learning curves, many trials and errors and thousands of wasted dollars on purchasing unnecessary ‘shinny objects‘ that only distracted me from real online success. But you don’t need to go through any of that. 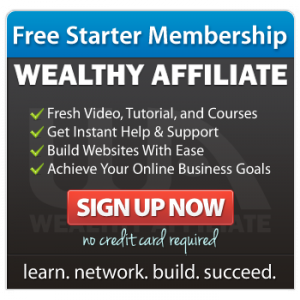 if you want to save yourself from the same plight then I highly recommend Wealthy Affiliate. Firstly they don’t have a big money claim, they don’t dangle enticing things in front of you. The owners are contactable and will communicate with you directly. They are transparent about the costs and what you will receive.There are plenty of positive comments and active feedback in chat rooms and blog posts all over the internet. There is an active vibrant community of novice and seasoned internet marketers who willingly answer all your questions and you don’t have to pay before you make any money. You can join for free before you decide to become part of the community. How can I Make Money with Affiliate Marketing? Follow their program, learn the process, understand the strategies, implement the systems and take action and you will learn to make money on the internet. This Post is very helpful and the video “How to spot a Pyramid Scheme” is so true. People on the top of pyramid earn more money when new recruiters are part of the business. Thanks for sharing this valuable information with your readers. I found your article on Scams excellent. In fact I have been scammed many times. I hope many more people will visit your site & be educated in this area. I also need to be delivered from the Shiny Object syndrome. But Thank God I am learning at WA. Thank you Peter. Very good article. I wish you the best of luck! I’m on day 3 of WA…and I have learned more than at any previous period….BTW…..your site rocks the house.!! One thing that is a way to indicate whether or not something is a scam is a company that keeps their product “secret” before you buy it. Without any inside look into the product or service you are getting, how are you supposed to know whether or not it is any good? When I buy something online or offline, my expectation is always to be able to “‘try before you buy” and as a rule of thumb, that is something that you should focus on within the online world (so you don’t get ripped off). There are far too many scams out there these days! This is really a great post – I identify with it so much! I was a victim of The Next Shiny Object Syndrome for years! I wish there was a way to take these guys out of the mix – they make it so much harder on the rest of us who are trying to make an honest living online. Thank you for this great article! I was very fortunate to learn about WA before I could be scammed by some site or the other. However, it was still a pleasure reading the info of this blog and the recognizing scams part is very helpful anyway. Again thanks for commenting on my website and I followed your advice and make use of the justify feature.